I flew home from OnStage yesterday very, very, very early. If you’ve never flown out of Orlando, then you have not experienced one of the most busiest airports in the world. Any transport service you use to get to the airport recommends a pick-up at least three hours prior to flight time to give sufficient time for check-in and security. My flight left at 7:00 am EST, which is 4:00 am PST (my time zone). So pick-up was at 4:00 am EST. I’ll let you do the math on that one. Talk about an amazing trip and tiring. I love these Stampin Up events, spending time with some of my best friends and reconnecting with my Demonstrator friends from around the Country. But, wow! Four days with 7000+ of your friends will wear anyone out. Stampin Up does a great job of keeping us busy and filling our schedule. I’ll share a recap with you soon of the event. Today’s card is the second swap that I took with me to OnStage. I really waffled on whether or not I should make a Holiday card for a swap since we’re already so close to Christmas. But, I loved how this turned out so I couldn’t resist making some of these to trade. The tree on this card is from the Nothing Sweeter stamp set. This set has several images that look like frosted cookies. And when I think of frosted cookies, I think of a homey Christmas cozied up next to the fire place, wrapped in my favorite red plaid blanket. Hopefully this card puts you in the mood for a cozy Christmas too. For the month of November, I’m giving you a FREE gift with your purchase as a thank you for selecting me as your Demonstrator. Purchases of $50 (pre-tax and shipping) will get a FREE Real Red Mixed Stain Ribbon ($6 retail price). Purchases of $100 (pre-tax and shipping) will get a FREE Tin Tile Embossing Folder ($10 retail price). Purchases of $150 or more (pre-tax and shipping) will get a FREE Buffalo Check Clear Mount stamp ($15 retail price). Plus, you get all your Host Rewards in addition to this. This is the best value. These are some of my favorites from the Holiday Mini Catalog and I hope you will enjoy them too. Fine Print: You can place your order online in my shop at www.dianebrowning.stampinup.net or click on the Order Online on the right side. Or you can email me your order if you have a credit card on file with me already. Orders emailed to me won’t be placed until I return from OnStage (11/11). If you are worried about a product selling out, please place your order online right away. More Fine Print: This offer is valid only through me and not any other Stampin Up Demonstrator or through Stampin Up directly. This is my thank you to you. If any of the above items are sold out or no longer available, I may substitute with another product of similar value. I will ship these items separately once I have verified your order. If you qualified for the Tin Tile or Buffalo Check stamp but already have them, please let me know so I can substitute for something else. You will receive only the one item based on the total amount of your purchase, not all the items. Don’t forget our November special! 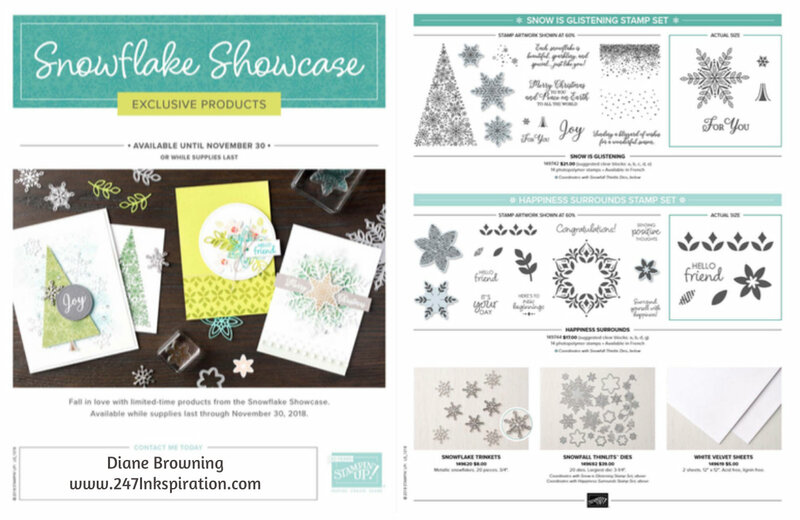 Our Snowflake Showcase is an exclusive group of products that will be available only during the month of November or while supplies last. I think I’m most excited about the snowflake dies and the White Velvet paper. Check out our brand new accessories for your Stamparatus! We have grid paper which is specially sized to fit the Stamparatus. This ensures that your paper is straight before you stamp on it. Extra plates for when you have those really big projects that use a lot of stamps. And an extra foam mat to give you better results when you use photopolymer stamps.